I love this time of year. The fall weather slowly approaches, the color of the leaves on the tree are beginning to turn color, and well, it’s comfort food season. That’s probably what I really love about this time of year! Back when our farmer’s market opened for the year, I was browsing some vegetable plants, and a lady next to me was saying that she had purchased from this one particular farmer last year, and the squash planted yielded an abundance of butternut squash. So with that said, I decided to but the plant for four dollars, and went on my merry way. Weeks later that plant began to grow in, and all over my backyard. I was cool with that, and recently after rummaging through the long grass, I also had an abundance of squash! I’ve been waiting for something to make with it for some time now, and I was giving a unique opportunity to also make something with a local sausage maker in Milwaukee. SA Braai, LLC make really amazing sausage known as Boerewors, typically known by many South Africans, but not so many Wisconsinites, well, at least not until now. This sausage is made with beef and pork and plenty of spices. Let’s just say that this husband and wife are making a really phenomenal sausage. 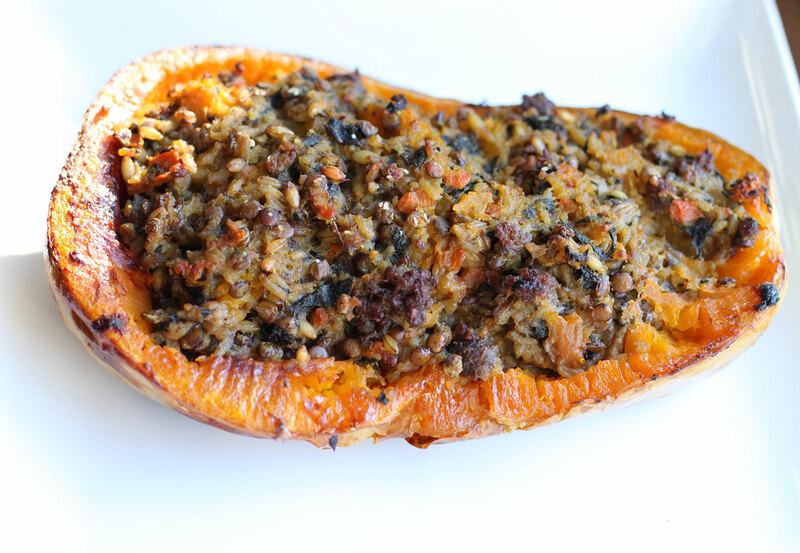 With all of this said, I set out to create something I knew my wife would fall in love with, and hence where the stuffed butternut squash with boerewors came into play. Start by making the stuffing for your squash. Bring a medium-sized pot to medium-high heat. Add in the butter, and let that melt. Toss in your lentils, rice, and barley and give this a good stir. Cook, and continue to stir for a few minutes. Next add the carrots and onion. Season with salt and pepper, then toss in the red chard. Stir, then add in your chicken stock. Give another good stir, then simmer for 30 minutes. After 30 minutes, remove from the hit, and partially open the lid to prevent it from over cooking. Once you have sliced your squash, take a knife and make score marks, about 1/2 inch down. Rub the skin with the canola oil, and place the squash onto a baking sheet, skin side up. Roast in the oven for 45 minutes. During this time, heat another large skillet on medium-high heat. Add the Boerewors sausage to the preheated skillet, and cook until the sausage is fully cooked. Make sure you crumble it along the way. Add the lentil mixture to the sausage, and give a good toss and stir. When the squash are done cooking, let them cool until you can handle the squash, about 10 minutes. Carefully turn the squash over, and use a spoon to remove the cooked squash, leaving the shell in tack. Add the squash to the lentil and sausage mixture, mixing well, then add this back into the cavity of the squash. Place the stuffed squash back into a preheated 425 degree oven and cook for another 15 minutes, or until the sausage mixture gets nice an crunchy. The result is nothing but a truly comforting fall recipe. You get this great bite of the lentil mixture. The lentils are not overcooked so there is still a bite to them, and when paired with the chard, and carrots, you know you are in good hands. It reminds you of a warm bite of mashed potatoes, but then you get this great texture and spice of the Boerewors sausage that just brings everything together. Let’s just say my wife fell in love with this one. What an intriguing dish – and beautiful colors. I love the combination of squash with the red chard and sausage. Very nice. Thanks Shea! I don’t often cook with chard but I loved it in the stuffing. I made this for a staff dinner with a few tweaks to cater to a vegan co-worker. I used mushrooms, olive oil and vegetable stock instead of sausage, butter and chicken stock. Seriously delicious, and so very easy to make. I’m thinking of trying it again this weekend (non-vegan this time) and maybe adding dried cranberries and spinach. Mmmm! Cait – thanks for trying the recipe. 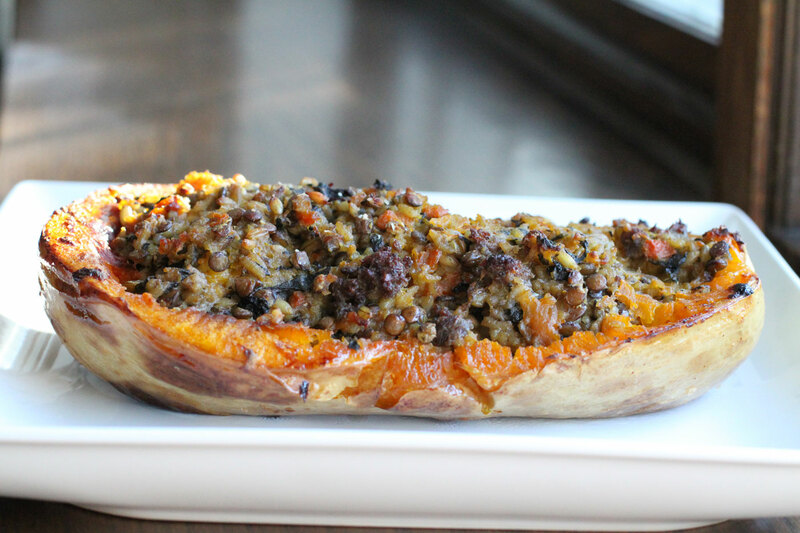 That’s the beauty of this squash recipe; you can come up with a variety of stuffing ideas! Yours sounds great as well.